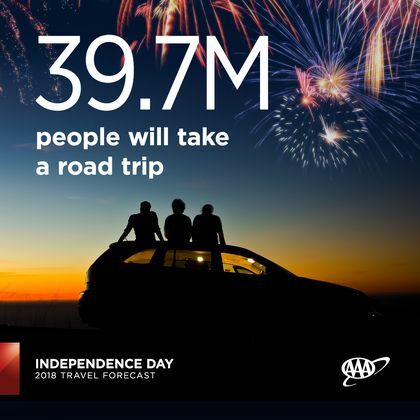 A record-breaking 46.9 million Americans will travel 50 miles or more away from home this Independence Day holiday, an increase of more than 5 percent compared with last year and the highest amount since AAA started tracking 18 years ago. For the 39.7 million Americans planning a Fourth of July road trip, INRIX, a global transportation analytics company, predicts travel times in the most congested cities in the U.S. could be twice as long than the normal trip, with Tuesday being the busiest day. Independence Day travelers will total 6.39 million, an increase of 5.3% from 6 million in 2017. 5.35 million will travel by automobile, up 4.7% from 5.1 million in 2017. 528,000 people will fly to their destinations, up 9.9% from 480,000 in 2017. 507,000 people will use other modes (bus, train, boat, etc. ), a 7.1% increase from 473,000 in 2017. Gas prices have slowly but steadily started to fall since the 2018 high of $2.97 set over Memorial Day weekend. Since then, the national gas price has dropped five cents to $2.88 (as of June 20), which is 59 cents more than one year ago. However, the higher prices are having little effect on travelers this Independence Day, with record number of travelers still planning to hit the road this year. Travelers can expect to pay more to rent a car and stay at mid-range hotels this Independence Day. At $66, the average daily cost of a car rental is a slight increase of 2 percent over last year. The average nightly rate at AAA Two Diamond hotels is $147, 11 percent more than last year, while AAA Three Diamond hotels will average $187, a 2 percent year-over-year increase. Across the country this Independence Day, travelers will flock to theme parks in Orlando and southern California, while many others are heading west. Alaska cruises departing from Seattle, Anchorage and Vancouver round out the top five U.S. travel destinations for the holiday. For those venturing overseas, Europe is a major draw, with Rome, London, Dublin and Paris all making the list of top international travel destinations for Independence Day. Nationwide, AAA expects to rescue more than 362,000 motorists at the roadside around the Independence Day holiday. Dead batteries, lockouts and flat tires will be the leading reasons AAA members will experience car trouble. AAA recommends motorists take their vehicle to a trusted repair facility to perform any needed maintenance before heading out (AAA.com/AutoRepair). Oil changes, fluid level checks, battery tests and tire inspections go a long way toward reducing the chances of a breakdown.